Australian racer Josh Brookes will return to the Isle of Man TT in 2018 with Norton factory machinery. The 2015 British Superbike champion will compete on the SG7 machine which is undergoing development in the hands of two-time TT winner Steve Plater. Brookes enjoyed a successful return to the Mountain Course last year which included the fastest-ever lap around the TT course by a Norton machine. He said he is "raring to go again and build on last year". 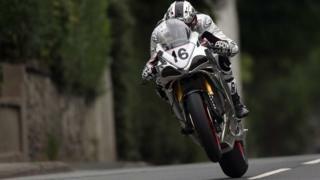 His quickest-ever lap of 130.883mph was recorded on way to a career-best sixth-placed finish in the Senior TT race. Last year, the Australian racer finished second in the British Superbike Championship, just three points behind eventual winner Shane Byrne. He said: "It was a real honour to represent Norton last year. "After a couple of years away it took me a bit of time to get dialled in again and despite the weather disruption, I really felt comfortable by the end of race week. "I'm raring to go again and build on last year with the team and add to their history around the Isle of Man." Norton CEO Stuart Garner says he is one of a handful of riders capable of competing for podiums and race wins at the TT. "Josh (Brookes ) is a rider with the ability and potential to rewrite the record books," he said.